I rarely get round to documenting projects, but I made some time to take some photos of my day van/occasional camper/all-round useful vehicle system. Not use lots of expensive and hard to find materials. I wanted to make it out of 12mm ply, but when I got 4 or 5 boards worth of 9mm in serviceable condition free from Gumtree from a recently refurbished cafe, that was one design decision made for me. I tried to come up with a full design before I started, but I realised there were so many different things to consider that the best thing to do was start chopping and see what happened. It's still a work in progess really, but I've got something I'm happy with for now. It starts with a base board covering the whole flat area, providing a base for everything else. 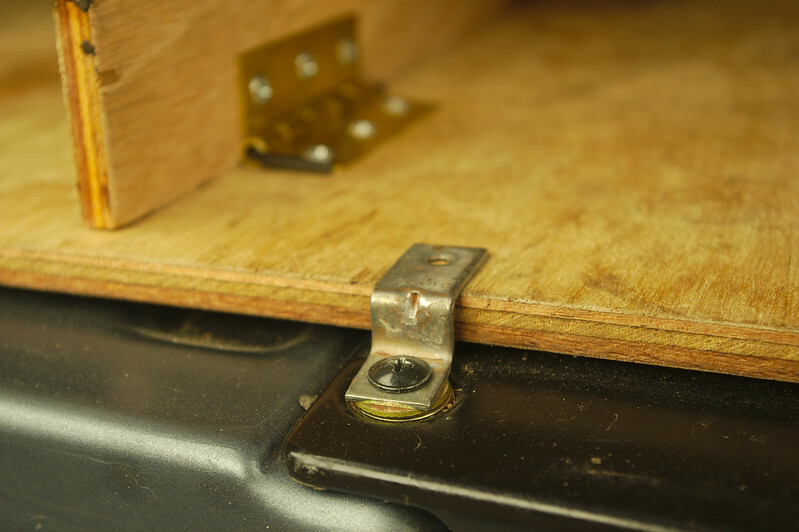 It's attached by the four existing load lashing points (which are still there on top of the board), and a small bracket at the back that bolts into the tailgate latch. 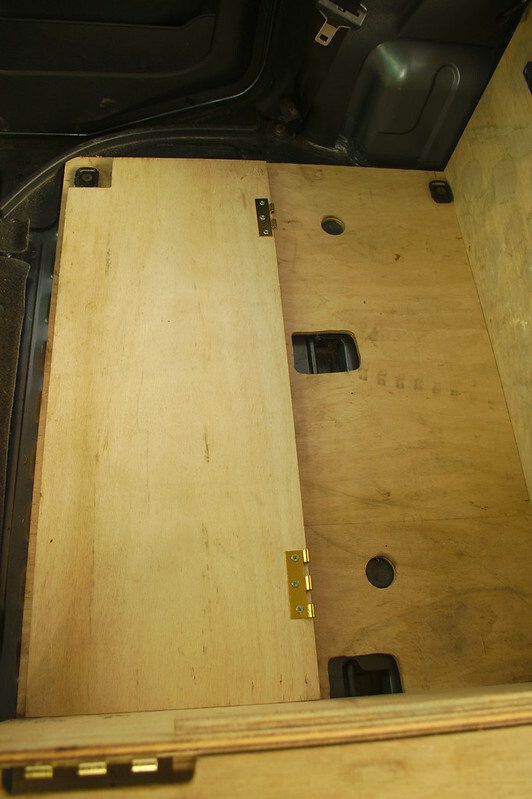 There are cut-outs for the seat hooks and feet (the base board doesn't have to be removed to use the seats), and the spare wheel carrier thing. 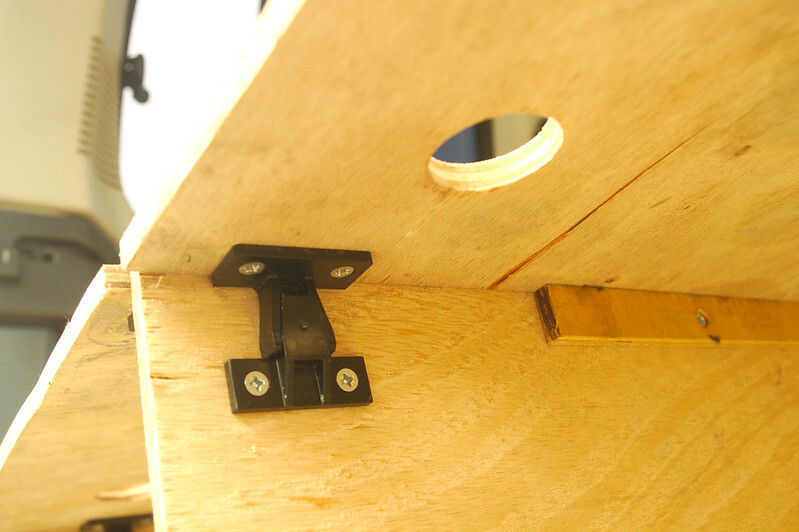 A two-part divider fits lengthways into a slot in the base board. 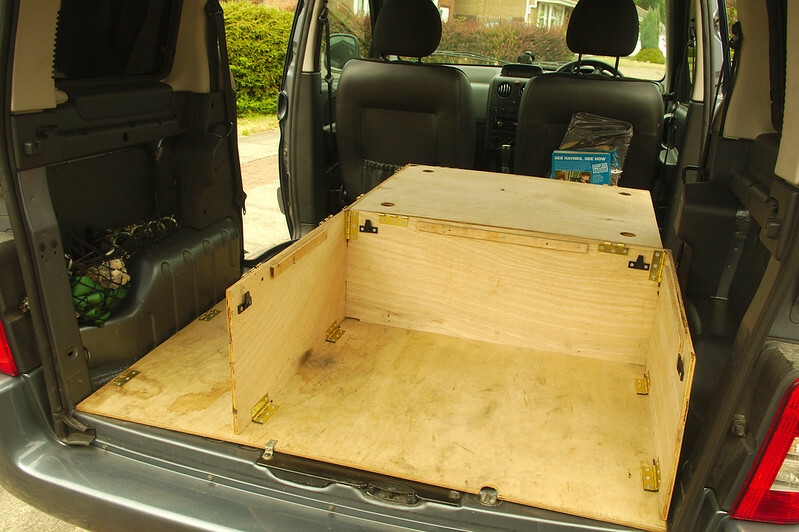 This is positioned so that it'll go through the rear seat split if necessary (it's a bit of a squeeze but it works). This creates a space for long stuff on the nearside (i.e. bikes). Next a lateral divider slots into the longitdudinal divider and the base board to divide the larger space up and stop stuff moving around. A similar board at the front stops stuff trying to get into the front seats. 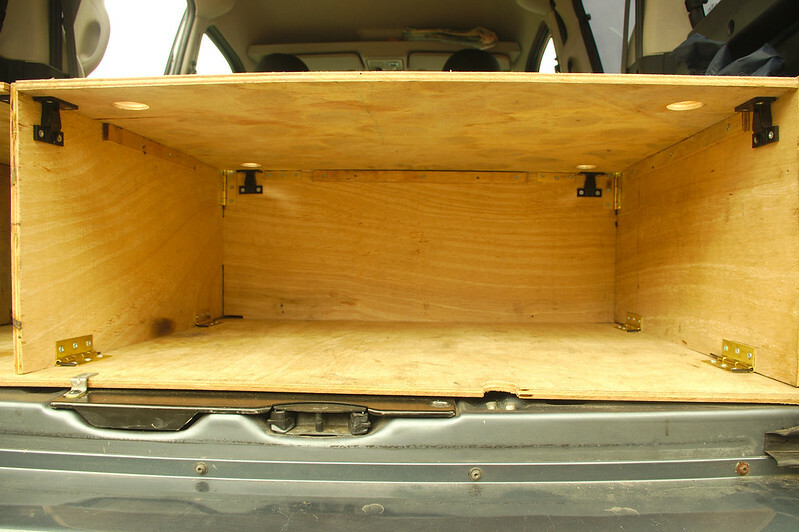 The rear compartment has a third side which isn't really necessary for enclosing that space, and is mainly there as a support for the board that will go on top. With the front bed board on, you get an enclosed space, and a seat of sorts. 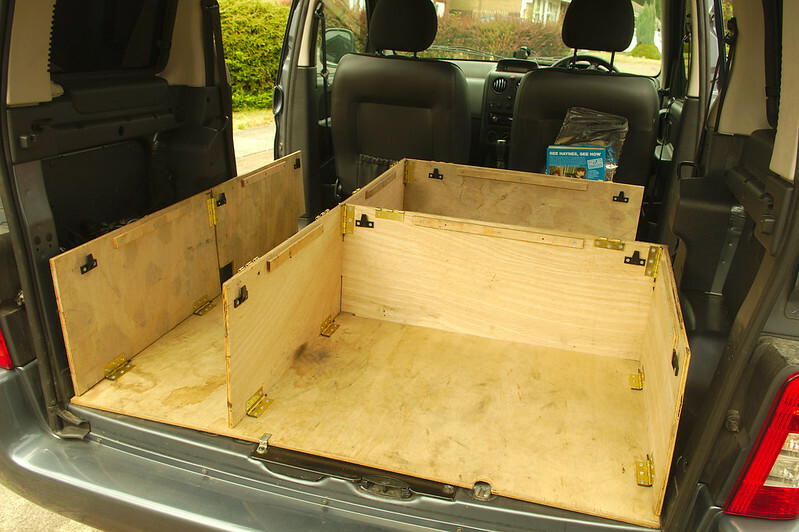 Put the back board in as well and you have two enclosed storage spaces, with space down the side for bikes. And if you take the driver's headrest off, and wind the seat back right down, you get a reasonably comfortable bed for one (with a mat of course), with plenty of space underneath for kit, and the bike inside. A second level of dividers gives you a space to put stuff on top of the bottom storage areas without it sliding around (though nothing too heavy). 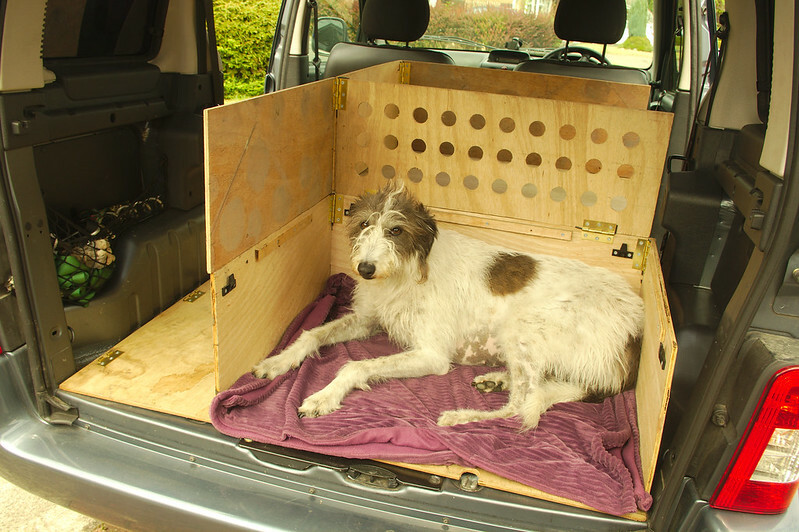 Taking the back bed board off makes room for the dog (modelled here by Rosie). 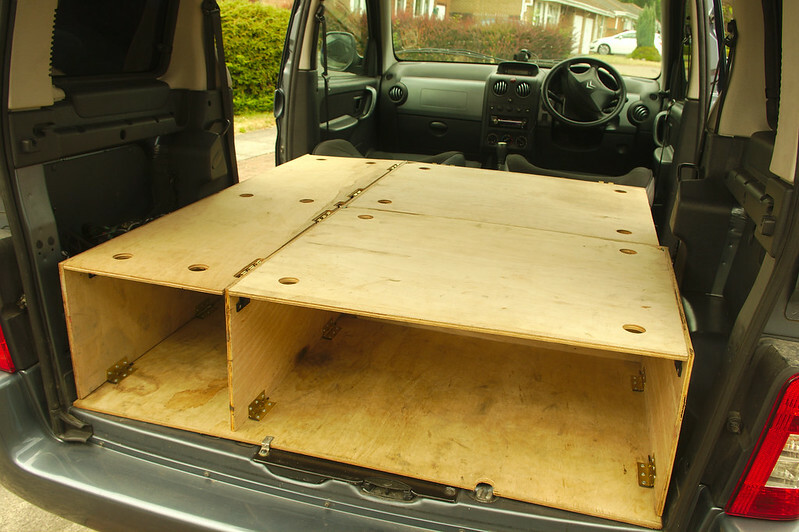 I made a set of side panels for the nearside - again not really necessary to enclose the space, but support a third bed board. 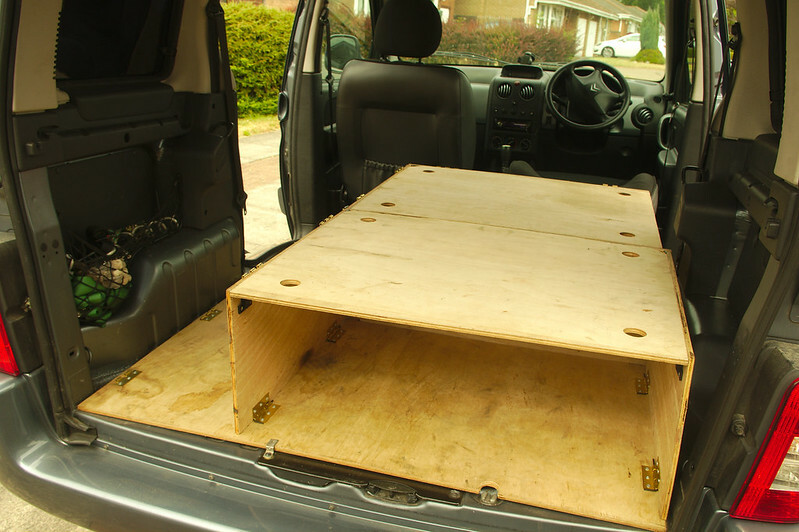 Said bed board can be used on its own, giving a kind of bench seat, e.g. for sheltering in the van with a cuppa when the weather turns. 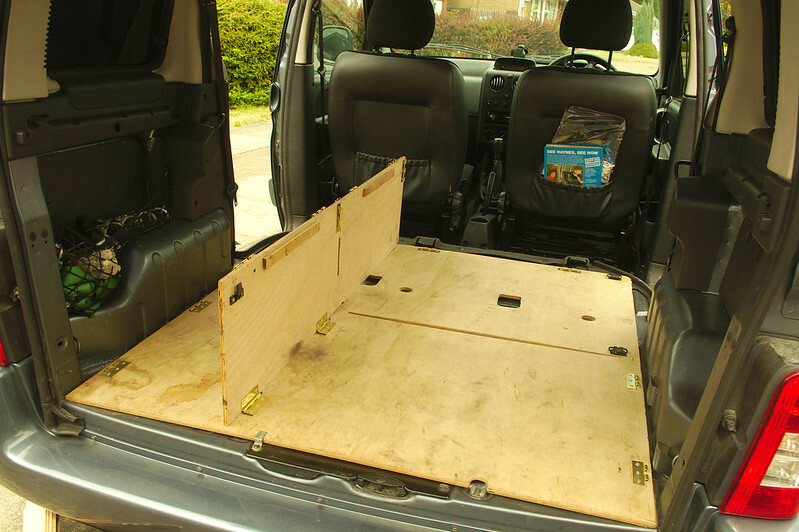 With all the bed boards in, you've got compartmentalised storage underneath and a big space above, or again, if you put the front seats back, a sleeping area for two with space for kit underneath. With the long bed board in, it's still possible to get a bike in with both wheels off on top, with storage space underneath. 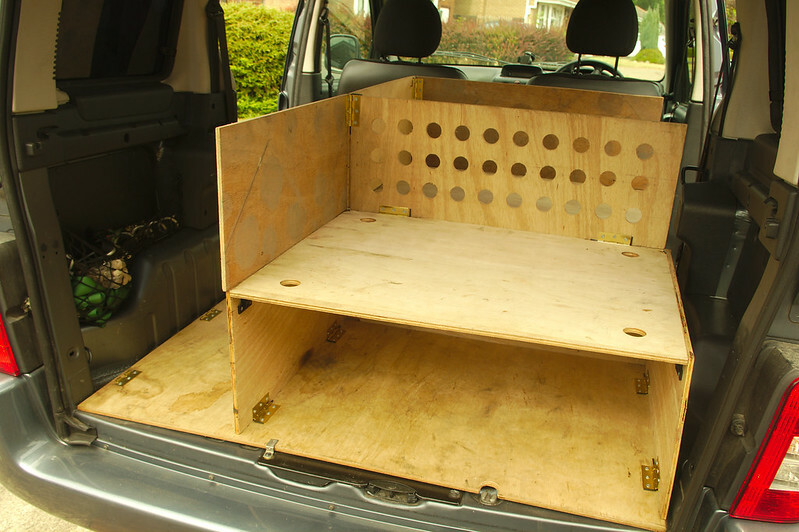 The side panels can also be folded down flat and don't take up much room. The long bed board can go on top, so you can carry a bike, but then use the bench when it's out. 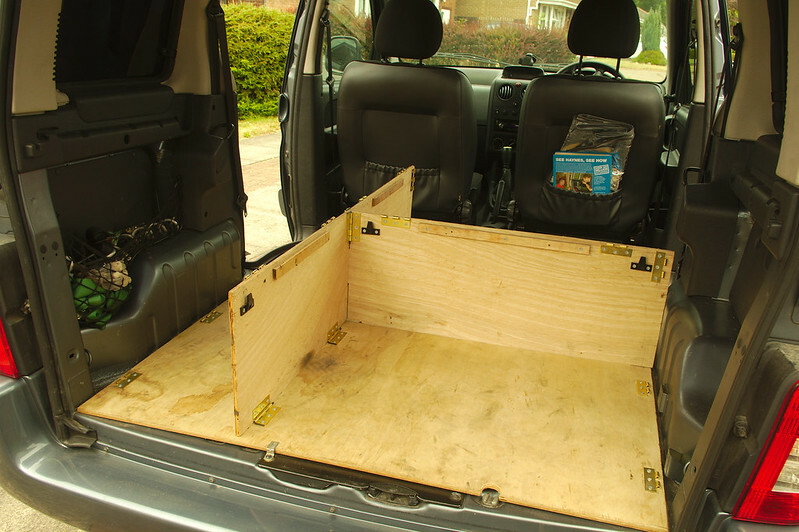 Similarly, the rear bed board can be carried underneath the dog, and then used with her out. 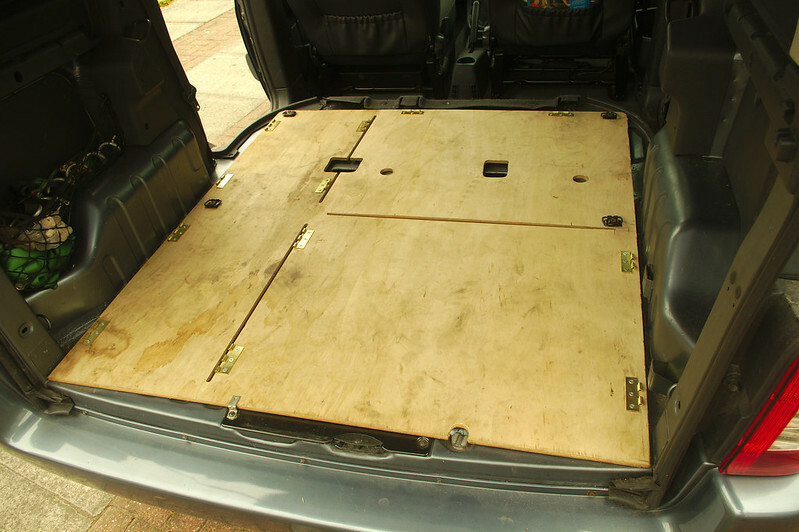 This then makes a nice standing height work surface at the back, e.g. for cooking/making a brew. The frontmost panel also folds down, which is occasionally useful to make use of the rear footwells (it might as well since it's hinged anyway). 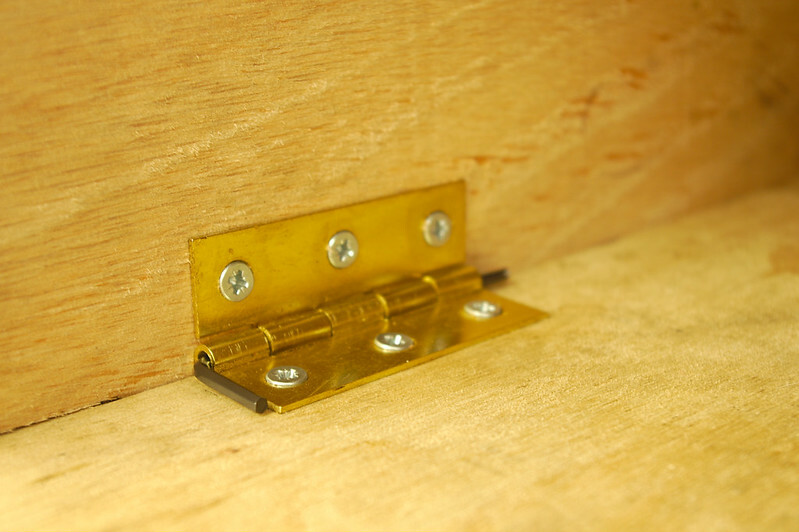 Most of the panel joints are made from loose pin hinges, the main attraction being they're a qiud a pair from Toolstation, so cheap and easily replaceable. 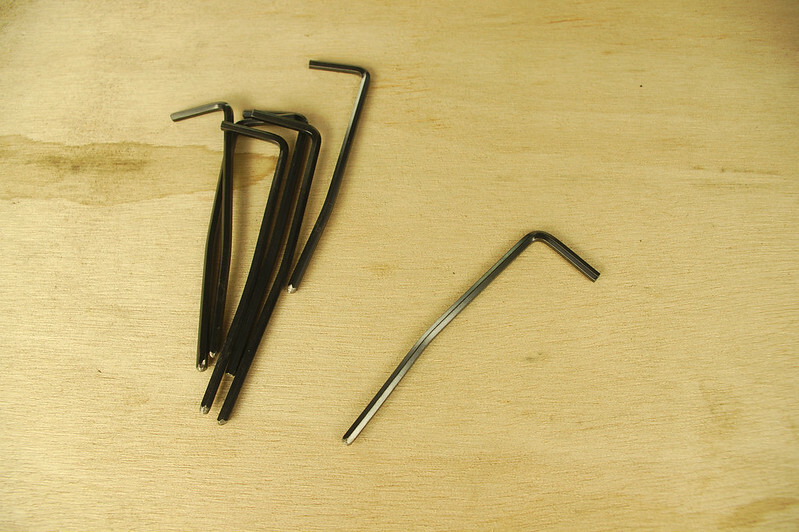 To make them easier to join and take apart, I replaced the pins (which have a sort of peened mushroom head which is impossible to remove without tools when under tension) with 3mm allen keys (£3.50 for 10, delivered from RS). I've cut these to length, rounded the ends on my grinder and given them a slight kink by hand with one end in a vice. This gives them just a little bit of tension even if the hinges are perfectly aligned (which most aren't), enough that they don't rattle or fall out, but not so much that they can't be pushed in and pulled out by hand. 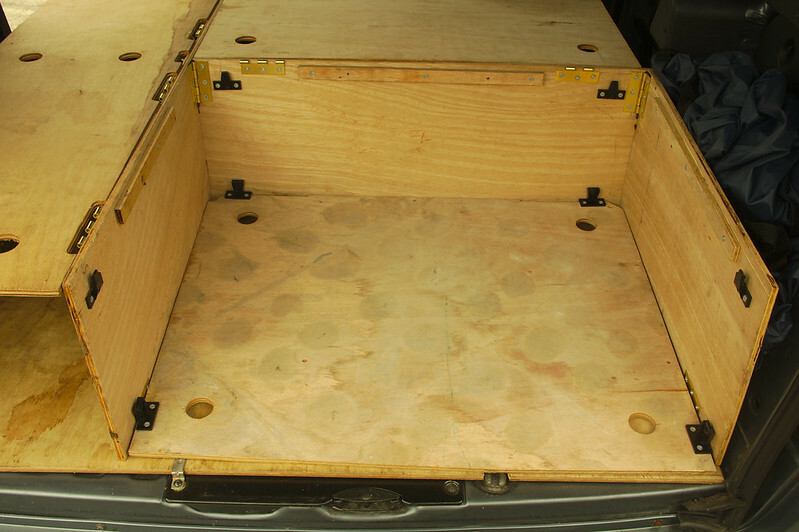 The bed boards all have Keku fittings to hold them in place. 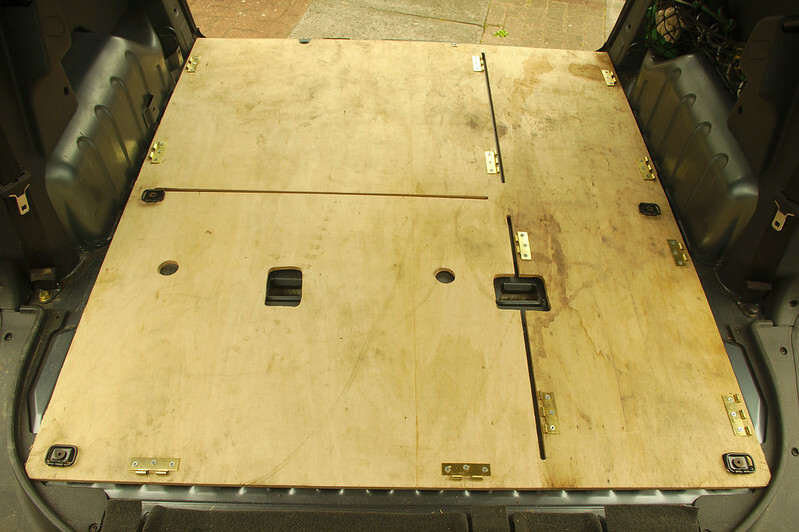 These can take a bit of loading, but there are thin strips of ply on the dividing panels which are the main load bearers. I'm quite impressed with these. They hold together quite nicely, are surprisingly robust, and pull apart reasonably easily. Inevitably due to the way they stick out when apart, I have broken one however. Ultimately I'd like to come up with a better solution. I can probably put the whole lot (apart from the base board) in and out in 10 minutes (and most of that is working out which bit goes where - I haven't come up with a marking scheme to help with this yet). 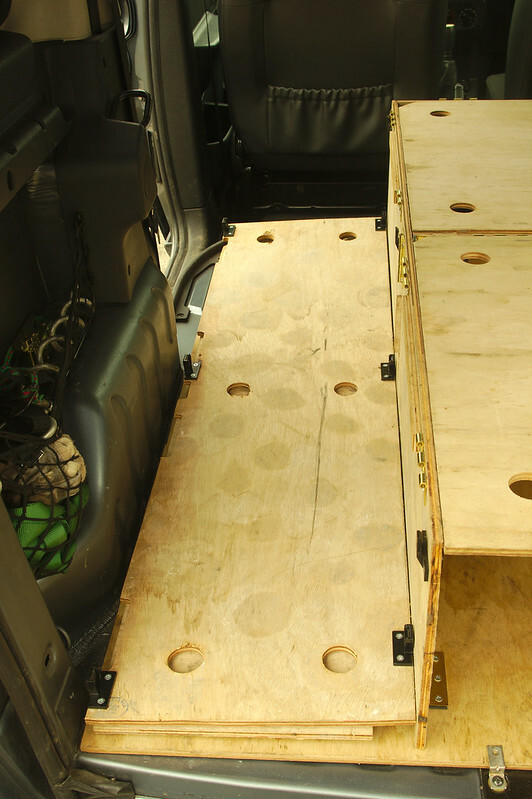 When it's out, you have a stack of vertical panels and the three bed boards, so it's fairly easy to store. Some things I might change or add in future are the Keku fittings (as I mentioned before); hatches, or possibly splits and hinges, in the bed boards to give access to the stuff below without pulling the whole board off; a way of dividing the bike space up better when it's not being used for bikes; a table arrangement for the side "bench". There's lots of stuff I could do, but I could end up spending more time working on it than using it. That looking very versatile! Does your dog travel happily laying in her designated area or do you have her on a harness as well? I am just finishing my conversion and have the single bed on the passenger side and the sink/hob opposite it. My young sighthound is a real fridget travelling, if he would lay on the bed that would be fine, but he stands up and then gets half of himself on the floor and half not,(he's harnessed) tries to get his head out the passenger window, bumps his head on the multispace lockers, talks and walks the entire journey! He sometimes manages to duck down and wriggle backwards out of his harness too, I have to think of a way to secure him in the centre isle. I think it is going to be with a rope coming from each of the rear seat belt top fixings to the harness ring behind his shoulders and i might have to devise a breeching strap like a harness horse has to stop his houdini antics. I am going to have a piece of ply that fits between the sink/hob unit and the foot half of the bed (at bed height) for him to sleep on. This will be the same length as the span between the end of the unit and the nearside wall and double as a worktop for daytime use. Well that the theory anyway! Did you plan all this beforehand or did it partly evolve as you went? I found that some things did not quite work as I'd thought and needed to use plan B or C even..
(20-07-2018, 02:56 PM)DreamSeeker Wrote: That looking very versatile! Does your dog travel happily laying in her designated area or do you have her on a harness as well? 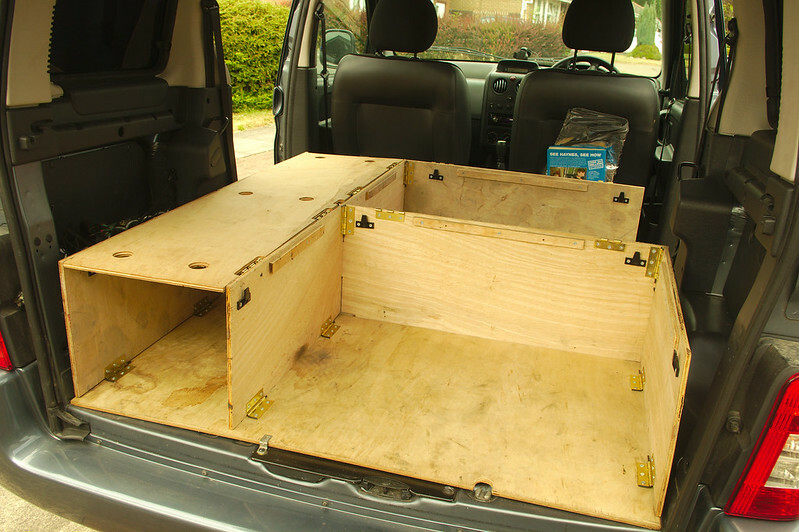 I am just finishing my conversion and have the single bed on the passenger side and the sink/hob opposite it. My young sighthound is a real fridget travelling, if he would lay on the bed that would be fine, but he stands up and then gets half of himself on the floor and half not,(he's harnessed) tries to get his head out the passenger window, bumps his head on the multispace lockers, talks and walks the entire journey! He sometimes manages to duck down and wriggle backwards out of his harness too, I have to think of a way to secure him in the centre isle. I think it is going to be with a rope coming from each of the rear seat belt top fixings to the harness ring behind his shoulders and i might have to devise a breeching strap like a harness horse has to stop his houdini antics. I am going to have a piece of ply that fits between the sink/hob unit and the foot half of the bed (at bed height) for him to sleep on. This will be the same length as the span between the end of the unit and the nearside wall and double as a worktop for daytime use. Well that the theory anyway! Did you plan all this beforehand or did it partly evolve as you went? I found that some things did not quite work as I'd thought and needed to use plan B or C even.. Yes, the dog lies quite happily in the space. We've found she's generally happier travelling in a space where she's slightly confined rather than having lots of room to slide around. I think she likes having something to lean on and feels snug. Sorry this doesn't help your situation very much. We got very lucky with her, she travels well. I spent a while before I started trying to plan it out, but I realised that the only way to really see what would work would be to design bits as I went along, so that's largely what I did.